In Chelsea Cain's bestselling series debut, Portland detective Archie Sheridan has spent years tracking Gretchen Lowell, a beautiful serial killer. In the end she was the one who caught him, but after torturing him for days she mysteriously let him go and turned herself in. Since then the she has been locked up, leaving Archie damaged but alive in a prison of another kind—addicted to pain pills, unable to return to his old life, powerless to get those ten horrific days or Gretchen off his mind. When another killer begins snatching teenage girls off the streets, Archie has to pull himself together to head up a new task force, but even then he can't stop him without getting information from Gretchen—an encounter that may destroy him. With Susan Ward, a hungry young newspaper reporter, profiling Archie and his team, Archie, the killer, and Gretchen enter into a dark and deadly game. 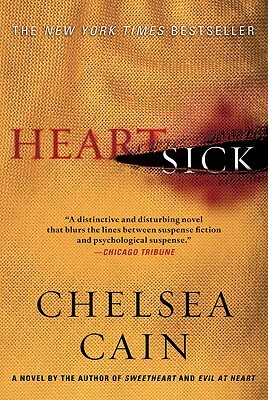 Each novel in Chelsea Cain's scorching series leaves readers wanting more of the twisted and destructive relationship introduced in Heartsick.